Positioning on the LumaGEM® Molecular Breast Imaging (MBI) system is analogous to mammography for obtaining standard CC (cranial caudal) and MLO (mediolateral oblique) images. Its similarity to mammographic positioning makes LumaGEM an easy modality for any trained mammographer to learn and use, and easy comparison to the original mammography views by the radiologist. The breast cancer scanning procedure may begin five minutes after the patient has been injected with a small amount of radioactive tracer (Tc-99m Sestamibi). The tracer preferentially accumulates in cancer cells, and is not influenced by breast density. The patient sits comfortably while the breast is immobilized between two gamma cameras, using just enough pressure to keep it stationary for 5-10 minutes while images are taken. Compression is used only to stabilize the breast adequately, which means that minimum compression is required compared to mammography. 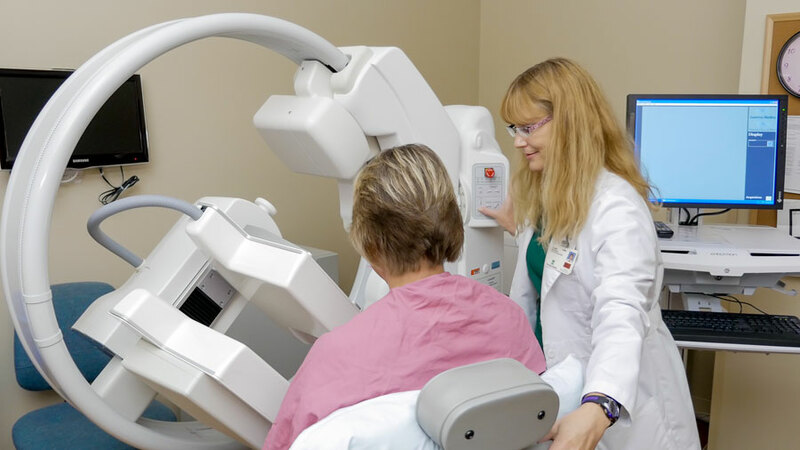 The entire breast cancer screening study takes approximately 40-45 minutes; and images are immediately available for a physician’s interpretation.